I am a born again believer, a Christian, a child of God and this earth is NOT my home. I’m happy to be alive and on this earth, but the biblical fact is I never was meant to stay here because a home is being prepared for me and it’s real and I’m going. One of my favorite songs is Home, which is the song from the movie and play called The Wiz. Every time I hear that song I think of my heavenly home and I smile. Heaven is where I started out. One day when I was in deep prayer God told me I started out as a thought in His mind and then He gave me life through my earthly mom and dad. For a child who grew up thinking I was a mistake because of a learning disability , God’s comment to me meant more than I could say. I cried and cried at the thought that I didn’t just happen to be here on earth, I was a planned pregnancy from my Father in heaven. No matter how we arrive on this planet, we were not an afterthought but planned from the heart of God. Halleluiah!! So you can see why in my heart I long for home. Someone who loves me so much is there and He’s planned for me to be there with Him one day. Many members of my family are there already. I have two brothers I’ve never seen. My brother Mervin Mckelvin who got to go very early at the age of 2 years old and my brother Jesus who I know because we share the same Spirit and I’ll get to see them both face to face. He told me He will come and get me if I don’t come there first. Message for today: It won’t be long before we go home. Do what you can while you’re here…..and always keep your heavenly home on your heart. Great!! !…..We believers have great things in store…..all in heaven someday…all together living in peace and harmony…..and no more physical pain in human form……may we all live long, healthy lives and rejoice that we will one day all be in a better place….Amen! I can’t wait to see Jesus!! what a day of rejoicing that will be!! Girl….I’ve got both hands up in the air praisin’ the Lord right now!! See you there…………some day soon. 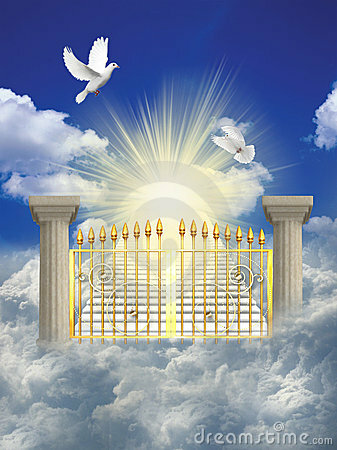 I love this, and especially the picture of those golden Heavenly gates! I’m right there with you — won’t it be fun to meet up with each other when we both get Home?! !